As the third night of action at the 2018 men’s and women’s NCAA Division II championships got underway in Greensboro, two meet records were broken while the Queens University men and women retained their lead in the race for the national team title, despite a slight mishap in the lady’s 800 free relay. For event-by-event coverage, check below. Lindenwood’s Morgan Fishcher nabbed a win in the B final with a 4:52.84. Cal Baptist freshman Buse Topcu took the win in the A final with a time of 4:47.14 which was good enough to get ahead of Lindenwood’s Simone de Rijcke who swam a 4:47.88 for second. Drury’s Erica Dahlgreen took third in a time of 4:49.82 while Bridgeport’s Annagrazia Bonsanti rounded out the A heat with her 4:58.77. The B final featured a win from last night’s 400 IM champion, Florida Southern’s Matthew Holmes, who produced a 4:25.92. Drury’s Joan Casanovas nearly dipped under the 4:20 barrier with a 4:20.08 while Simon Fraser’s Rolando Hernandez touched well behind in 4:21.59. In third with a 4:22.57 was Nova’s Franco Lupoli while Simon Fraser’s Andrew Woinoski touched in eighth overall with a 4:32.08. Drury’s Yekaterina Rudenko narrowly took the win in the A final with a 53.34, ahead of Oklahoma Baptist’s Celina Marquez who touched second in a time of 53.37. Third place was awarded to Sioux Falls freshman Cassandra Wright who touched in a 53.44. Rounding out the A final was LIU’s Karis Fueller in a 55.34. B final winner, Queens Zach Bunner, swam a 47.80 on his way to victory. Queens senior Paul Pijulet set a new national record in a time of 45.88, which was well ahead of Delta State’s Giulio Brugnoni who touched second in a time of 46.48 while Grand Valley’s Harry Shalamon took third in 47.12. Taking eighth was Florida Southern’s Brandon Dyck in a 47.86. UCSD’s Anshanika Phetbenjaku took the win in the B final with a time of 1:02.36. Drury University’s duo of Bailee Nunn (59.89) and Zuzanna Chwadeczko (1:00.58) took an impressive 1-2 finish in the A final while Carson-Newman’s senior Maggie Melhorn swam a 1:01.14 for third overall. Rounding out the A final in a time of 1:03.32 was Truman State’s Natalie Galluzzo. UCSD’s Edgar Chin posted a 53.76 to win the B final. Drury’s Andrea Bazzoli swam to an A final victory in a time of 52.71 while Saint Leo’s Henrik Dahrendorff took second in a 52.93. Florida Southern’s Luis Jasso swam to a third place finish in 53.22. Wayne State’s Sasha Palazzo rounded out the A final in a 54.23. Last night’s 400 IM champ, Nova’s Courtney Deveny, swam to a B final victory in a time of 2:00.92. Queens senior Mckenzie Stevens broke her own NCAA Division II record in a 1:56.89, a time a full second ahead of Simon Fraser’s Jessie Gibson who touched in a 1:57.97. Cal Baptist’s Sofia Petrenko nabbed third in a time of 2:00.19. The B final was taken by Queens senior Zach Bunner in a time of 1:45.42. 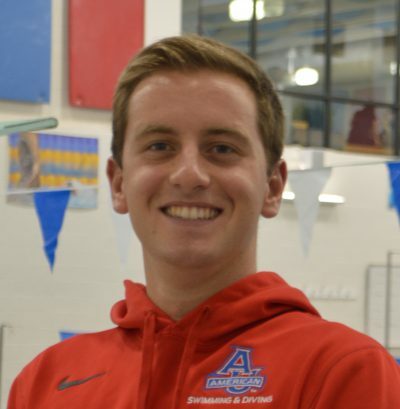 Queens junior Marius Kusch swam a 1:42.16 to earn his third victory of the meet, just .12 off his own NCAA DII record. Findlay’s Janko Radmanovic took second in a 1:43.15. Lindenwood duo of Matheus Isidro (1:44.98) and Cristian Vasquez (1:46.43) took third and fourth, respectively. Taking eighth overall in 1:55.84 was McKendree’s Matija Pucarevic. Clarion’s top diver Christina Sather put up a score of 482.90 to win the A final while Mikayla Karasek posted a score 461.50 with St. Cloud State’s Britin Thomsen taking third in a score of 446.35. Wingate’s group of Hanna Van Horen (1:50.77), Abby Kosic (1:49.75), Maria Madsen (1:49.97) and Alexis Divelbiss (1:47.31) produced a 7:17.80 ahead of Lindenwood in a time of 7:18.13. Queens, who was seeded first going into tonight, fell to third in a time of 7:22.62. The Queens men’s squad of Marius Kusch (1:33.76), Alen Mosic (1:36.98), Nicholas Arakelian (1:37.13) and Christopher Mayes (1:37.55) threw down a 6:25.42. Taking second was Florida Southern’s team who posted a 6:19.69 while Indianapolis took third in a time of 6:31.02.